Mpow Ear Protection for Kids is flexible and adjustable to fit your child comfortably and snugly. Offer exceptional kids hearing protection for your child by keeping out external noises. Noise levels above 125 dB for even a short period can cause permanent hearing loss. And your child may become sensitive and triggered when exposed to a crowd with noise going on. To prevent these potential damage, we are bringing you exceptional noise cancelling ear muffs for your child. 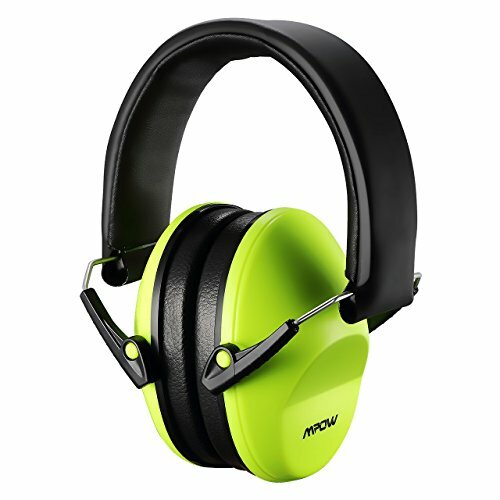 Mpow Kid Ear Muffs help you protect against hazardous noise levels arising from a variety of social or leisure activities including monster jam/ monster trucks, hunting season, sporting events, air shows, motor sports, music concerts, etc. NRR SOUND TECHNOLOGY: Designed with noise-dampening sponge, soft ear cushions and solid ABS ear cups that seal around your ears, our toddler ear protection ensures NRR (Noise Reduction Rating) 25dB for noise reduction. Protect your child's hearing by blocking out the noise of monster jam/ monster trucks, hunting season, sports events, concerts, Disneyland, airplane flights. Good gift idea for hearing protection for kids. DURABLE SOFT AND COMFORT: The kids ear protection can bring lightweight and extremely comfortable experience for your child. The padded headband and soft ear cushions can bring your child comfy wearing experience while ensuring snug fit. ANSI S3.19 CERTIFIED: Adopted eco-friendly and non-toxic materials, our noise cancelling headphones for kids allow durability for safe and constant use and prevents from irritating. ADJUSTABLE HEADBAND DESIGN: Retractable stainless steel with rotatable design ear muffs for kids can be flexibly adjusted to suit various sizes. Fit for children from 3-YEAR-OLD to 12-YEAR-OLD. COMPACT AND COMFORTABLE: The toddler hearing protection folds up easily into the headband. The compact folding design for storage and a travel drawstring bag is included for easy packing.